Since I was off work yesterday, I'm a little confused about what day it is, and what I have to get done. So, today's post will be equally jumbled ;-). I spent the day yesterday with Mike at Boston Outpatient Surgical Suites - a very nice facility with an awesome and friendly staff. 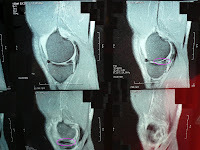 Mike tore his meniscus in the right knee, so he went in for arthroscopic surgery not to fix the tear, but to cut out the damaged pieces. So far, he is being a good patient, and is recovering relatively pain free. We'll see how he's doing after a week of recuperating ;-). The weather is more spring-like this week - cooler temps and a little bit of rain. I have to say I don't mind, because the result is the awesome display of color in my just coming alive spring garden. And Oreo is a trooper to put up with Mike and I - look at the abuse this poor cat takes ;-).